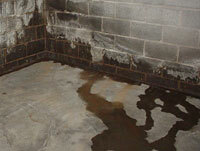 Superior Basement Systems of Ohio is your local source for professional basement waterproofing contractors in the area. We serve Alliance, Ashland, Cadiz, Dover, East Liverpool, Hartville, Massillon, Millersburg, New Philadelphia, Salineville, Wooster, Yorkville and all surrounding areas. 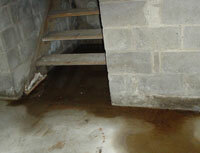 For a FREE wet basement repair quote, call or contact us online today! 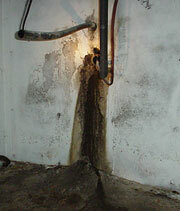 Stop the water right at the point where it's causing the problem - along the perimeter of the basement floor. Superior Basement Systems does this by removing a portion of the basement floor, creating a trench, and filling it with clean stone. On top of this stone, the patented WaterGuard® system, an innovation on old-fashioned French drains and Drain tile, is laid. The system is concreted over, and an extending wall flange creates a 3/8" opening to receive water from the basement walls. 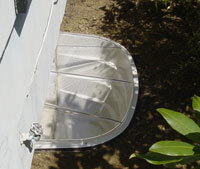 These can be combined with a covered basement window well that will deflect rain, water, and debris from the basement window opening as well as cold winter wind. The SunHouse™, recommended by Superior Basement Systems of Ohio, is also designed to reflect as much sunlight as possible from the outside into your basement space. Superior Basement Systems solves the problem of leaking wall cracks and pipe penetrations by sealing the opening with the FlexiSpan® system. First, the opening is sealed with a special polyurethane polymer. This polymer can expand and shrink with the basement wall, meaning that it will not lose its bond as the concrete swells and shrinks with moisture and temperature. 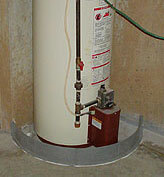 Superior Basement Systems recommends surrounding the water heater with a PVC ring, which can either direct water into the perimeter drainage system or be combined with a water-sensitive alarm that will sound off to let you know a leak is occurring. When you decide that your basement water problem has to go, Superior Basement Systems is ready to help. Serving Alliance, Ashland, Cadiz, Dover, East Liverpool, Hartville, Massillon, Millersburg, New Philadelphia, Salineville, Wooster, Yorkville and the surrounding areas in Ohio, we're the local contractors you need. For a FREE inspection, written quote, and complimentary 88-page color book on basement waterproofing, call or contact us online today!